It can be troubling for a caregiver to watch their loved one with dementia walk around aimlessly. The person may walk around the house repeatedly or wander off day or night from the house. Because of their memory loss, they may think that they need to get to work when they have long since stopped working. They may ask to go “home” when they are home, but in a different house. Or they may be fixated to see someone, sometimes a deceased spouse, and leave the house to go find them. People with Alzheimer’s and other forms of dementia can be disoriented and easily become lost and unable to find their way back home. Dementia wandering can cause caregivers to be very anxious and concerned about the safety of their loved one. It is important to find solutions to wandering that keep them safe and still maintain their dignity. Motion detectors can be a great way to notify you, so your loved one does not leave the house through an outer door. A low tech solution is to hang bells from the door handles throughout the house so you know where they are or where they are heading within the home. If you have a garden, secure it with a fence and difficult to reach locks so that your loved one can get some exercise and fresh air outside. A circular path with points of interest like bird feeders, flowers, a water feature, or a bench can help make their time outside more enjoyable. Reassure your loved one if they feel lost, agitated or abandoned. Refrain from correcting them but try to redirect their focus. Check to make sure that their basic needs are met: are they thirsty? hungry? or need to use the bathroom? Sometimes these simple needs can trigger anxiety and a need to wander. If they are determined to leave, have them dress appropriately for the temperature. Make sure they have on shoes. Take an umbrella, hat, gloves or sunglasses depending on the weather. Accompany them, reassure them, and direct their attention, so you can bring them back safely. A stroll around the block may be enough to divert their attention. Make sure your loved one has proper identification on them at all times. Sew their name and a contact phone number into their jackets or handbags. Medical identification, like a bracelet or pendant, are helpful and less likely to be removed. Consider dressing your loved one in bright outwear that is easy to spot in a crowd. Location and elderly GPS tracking devices may help you find them quickly if lost. These are becoming more frequent options for families and caregivers. Some devices can be worn around the wrist, ankle or even a tennis shoe. There are short-range options designed so the caregiver can monitor a person themselves. Some sound an alarm when the bracelet and base unit get too far away. Other services charge a monthly fee and can pinpoint your loved ones location. You can even use your cell phone to track down the location of a loved one. These devices are useful but you still need to be vigilant. These devices can be removed, left behind, lost, or fail. Look for local services in your area for the best solution. Notify your neighbors and local shops that your loved one has dementia. They can act like a second set of eyes in your local neighborhood. To ease your anxiety, make a crisis plan. Have an updated list of contacts and phone numbers to quickly notify friends, family, and neighbors if a loved one goes missing. Write a list of possible places that your loved one might wander to – former employer, previous house, family, friend’s houses, place of worship, or a favorite restaurant. If a loved one does wander off alone, call 911 immediately. Have a recent, close-up photograph and up-to-date medical information to provide to the police when they arrive. Wandering is a big concern for many caregivers. 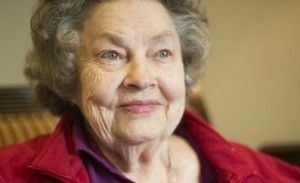 If your loved one cannot be safely secured within your home, it may be time to consider moving them into a memory care community that can handle their unique needs. Aegis Living had created innovative memory care communities that engage and stimulate memories for our residents in a secured environment. If you are fearful that your loved one may wander off, contact one of our memory care communities. We are happy to give you a tour of our innovative memory care features and safety measures.